I’m very pleased and proud to introduce the newest author to the Central Avenue cache of amazingly talented human beings, Alex Lyttle. I knew it was meant to be, because I couldn’t stop reading his middle grade contemporary novel. I then immediately asked if he’d like to be published by CAP. Luckily, he said yes. From Ant to Eagle is his first novel and it follows an 11-year-old boy through a tumultuous time in his and his family’s life. I’ll post more on his book once we’ve finished the cover and working through all the details. It will be published in April 2017. Recently, Noah Milligan was invited to share his expertise in writing on SkillShare alongside other great writers like: Ashley C. Ford, Susan Orlean, Yiyun Li, Benjamin Samuel and James Franco. Ever wonder how a writer hooks you into a story and compels you to keep turning the page? Join writer Noah Milligan as he dissects a short story and explains a step-by-step guide in creating enthralling narrative arcs. This 30-minute class breaks down various elements of short story structure, provides a writing prompt to start a new story, and offers insightful tips on crafting engrossing characters and plot. Students are able to post a new short story, engage in constructive critique with other students, and polish their projects to get them ready for publication. This class is designed for emerging writers crafting their very first short stories, more experienced writers honing their craft, and anyone who has ever had a story to share. A few days ago, I had the pleasure of being in the spotlight over at the IPG blog: This is a repost from that article. Michelle Halket, Publisher, Central Avenue Publishing, shares her unique insight as a digital pioneer. We discuss the early days of digital publishing, the breadth of social media marketing, and the flexibility that comes from being an independent publisher. IPG: Can you tell me a little about how Central Avenue Publishing was started? Michelle Halket: Unlike many in the publishing industry, I didn’t work in it before this — I worked for Nielsen in retail market research. I’ve always been an avid reader and the idea for this company started with a conversation in 2008 about how it should be easier for authors to get their work read. Ebooks were in their infancy and being a tree-hugging, book-loving technophile, the whole idea of a low cost, environmentally sound way to publish books really intrigued me. The first iteration of Central Avenue Publishing was ireadiwrite Publishing, which was basically a DIY type of venture where we would take anything that anyone submitted and put it into the many ebook formats and sell it on our website. A year later, I wanted a change. I wanted to feel really passionate about what I was helping to put out into the world and so we adopted a more traditional publishing model while still being true to our roots of publishing work that others might not. IPG: What differentiates Central Avenue from other publishers? Michelle Halket: You know, that’s a really hard one to answer. I don’t think any publisher is much different from any other one. We’re all in it for the same reasons, to publish books that we feel passionate about. I think our roots are different, in digital, and we remain pretty strongly tied to that side. But the actual books and process aren’t better or different than any other good publisher. I do believe that being a small publisher means we can change with the tides a little easier and quicker than bigger ones. It’s been the reason that we’ve made it thus far — reading the market and staying on top of it. And we’re small, really there’s just me and my authors. I work on each book personally and I outsource anything that I can’t or don’t have time to do. IPG: What do our readers need to know about your books? Michelle Halket: Well, that they’re awesome, of course! Speaking more seriously, I suppose we take a lot of pride in them. They’re truly a collaborative effort of the heart and soul on the part of the author and myself. We put some really good energy into our books and I think it shows through. IPG: What has your experience been with independent publishing? What are the benefits? The drawbacks? Michelle Halket: It’s been a truly amazing experience. And a truly challenging one. I think we’ve been up against a lot of prejudice since we started. First it was ebooks, when everyone else thought they were for self-help or get-rich-quick pamphlets. Then, it was the prejudice against small pubs, and then it was the judgment against and non-acceptance of books produced using POD. Thankfully, a lot of that has changed now and this old industry is catching up with the times. The rewards have far outweighed our challenges. I didn’t mind being ahead of the curve. I liked educating people on what I was doing. We have had numerous bestsellers – selling quantities that would rival the big houses – and being able to work to my goals and ideals has been amazingly freeing. I don’t have to kowtow to any corporate numbers or only choose books for their market value. I can choose to work on lit fiction, poetry, or memoirs from non-celebrities because they mean something, they contribute to the book world in a real way. I don’t think other publishers have that freedom. I know I could sell books if they tied into a celebrity or some other current event, but I don’t have to and I feel it advances the frontier of reading and book making. IPG: What advice do you have for prospective independent publishers today? 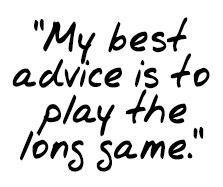 Michelle Halket: My best advice is to play the long game. Don’t try to come out with guns a-blazing, spending money left and right on your one season of a few books. Start really small, digital if you can, and keep costs as low as possible. Don’t spend what you make, invest it back into the company and plan on being around for a few years till you can make some money. 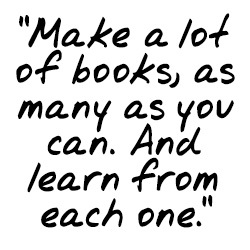 Make a lot of books, as many as you can. And learn from each one. Ideally, a publisher isn’t a writer. I think that being a writer/publisher often means that you become too vested in books, getting caught up in the writing/editing side and letting the other aspects of publishing slide. I’ve seen many, many writer/publishers come and go and I really feel for them, since they’re hard-working, intelligent people. Now, I know there will be a ton of responses to this, refuting what I’ve said and giving me great examples of self-published authors who’ve made it or started their own imprints (e.g. Amanda Hocking, Meredith Wild, John Locke). But there are few people who can do it all, or who want to, and now there is a pressure on writers not only to write well but to be publishers too. It’s a tough game and I could only imagine that doing both is exhausting. But no matter who you are: editor, writer, or ex-market researcher: if you want to try it, do it! Remember that it’s a long term business, think ahead, save money, publish as many books as you can. Keep the quality up, but don’t sacrifice getting them out there because it needs to be *perfect*. They’ll never be perfect, they can always be revised, have a new cover, price adjusted, etc. Keep releasing books and continue to work with authors who are professional, also have the long game in mind and moreover – whose personalities meld with yours. And by far the most important: treat your writers well. Pay them regularly, fairly, and on time. Answer their emails quickly and remember that they’re the reason you even have a business. IPG: You’ve achieved viral success a number of times, particularly with I Wrote This for You. How did you reach viral status? Michelle Halket: The funny thing about each of our books that have done well is that I believe that each of them did so for different reasons. I will tell you the things they had in common. For one, most were appealing to young adults. In a world where books and their distribution was changing so much, it was younger people who were trawling the net looking for new reads, communicated online, and for the most part, pirated content. I don’t advocate pirating, but I have never tried to take any of our books off pirate sites. The pirate sites were part of the reason we went viral on some books. The second reason is that each of those books had authors who were extremely active online but in different ways. The creators of IWTFY give away their work for free online. For them and me, it’s not about making money, it’s about sharing art. This global sharing led people to talk about it. But not everyone wants virtual art, they want something tangible. So when the book was released it did — and continues to do — very well. For Suzi Davis, (The Lost Magic series), she connected with bloggers who were gaining momentum. They glommed onto the books and loved them and her for contributing a mutually supportive arena. For NM Facile (Across the Hall), the book started as Twilight fan fiction and a lot of the earlier drafts were posted in writing forums. The author connected directly with her readers and gave them what they were looking for. For Annie O’Sullivan, (Can You Hear Me Now?) she used her history as a child abuse victim to help others in the same situation by appearing on radio, blogs and by speaking openly. IPG: How do you incorporate social media into your marketing strategy? Michelle Halket: In the early days of my company, and being a newbie to the industry, Twitter was my lifeline. It was this cool medium where I could listen to people discussing real things – and they weren’t selling me anything. They were just talking and collaborating. I met some of my authors on Twitter, learned some typesetting tricks and solved ebook coding problems by tuning into hashtags. There were fewer bloggers around, Facebook was easier to understand (and to be heard), and Instagram didn’t really exist. But since the beginning, I have always striven to remain professional and treat people as if I was speaking to them in person. Today, my social media strategy is a little different. I think I’m still kind, but I don’t engage on Facebook much anymore. Unless you’re paying for boosted posts, very little gets fed out to readers’ feeds, so I don’t really see the point. I use Twitter more to support those people I already know, rather than meeting new ones. I do listen a lot more than I talk, I only follow people who aren’t constantly selling me something and I listen to what is going on in the industry. I feel that the noise on Facebook and Twitter is so loud that it’s hard to be heard and I don’t want to contribute to the noise. That said, I still use Twitter every day, I post to Facebook and Goodreads once or twice a week, and I blog and Instagram once every couple weeks. When I’m looking to promote a book, I think reaching out to other bloggers who have dedicated readers is the best use of social media. I know that they each have between 5 and 5000 people who actively read what they’re writing. I also use our robust mailing list with MailChimp; Rafflecopter for our multiple giveaways; and Goodreads for the giveaways and stats they offer (for free!) to help me see what people are reading or would like to read. IPG: You’re one of our publishers that was there for the early days of digital publishing. Can you tell us a little about your experience as a “digital pioneer”? Michelle Halket: What a trip it’s been. As I mentioned, the early days of digital publishing had me holding up my newly acquired smart phone and trying to show people what an ebook was, researching what happened in the music and film industry, learning ebook coding for several different formats, and trying to get distribution with each of the many stores offering ebooks. I supported the new bookstores and platforms that would come online only to watch them fail miserably. I watched many bookstores, formats, publishers come… and go. The first few years were hard, I think my revenues were $900 in 2009. But in 2010/2011 when ebooks really took off, I had already made my mistakes, learned where to spend my energy, had a few books go viral and the market had dwindled down to a handful of stores and only 2 real formats. Then I could focus less on the technical side and more on the quality, marketing and sales of our books. Now that ebooks have levelled off (anyone worth their salt knew that would happen), it’s time to re-evaluate again. I have always believed that paper wasn’t going away, and now it’s time to strike a resounding format chord which balances paper, ebook and audio. IPG: How do you pick the titles you going after? Michelle Halket: I have three criteria for judging a book – writing, plot and characters. It needs to be fantastic in at least one of those areas — ideally all three! Of course, the author needs to have all the boxes ticked: professional, dedicated, etc. However, my overriding rule is whether or not I personally and professionally connect with the author. I want to rely on them, and they need to do that with me since I invest a lot in them and they’re trusting me with their literary babies. IPG: What’s next for Central Avenue Publishing? Michelle Halket: Next is getting to know my new distributor and all the avenues they’ve opened up for me! I know this is old hat to the vast majority in publishing, but working with traditional distribution has meant an overhaul of how I do business. I only use POD sparingly and have moved to offset for my new and best titles. I can now submit to the large reviewers without fear. I have access to bricks and mortar outlets I could have only dreamt of. I have a group of people I can rely on for good advice and information. There are multiple teams of people showing off my books to their customers. For someone who came in at this through a different angle and who works by herself in a small town outside of the meccas of publishing, this is a huge change. I figure the next year will be spent seeing how all this goes while maintaining my old tenets of slow organic growth that will sustain all of us. IPG: Finally, where do you see Central Avenue in five years? Michelle Halket: I see great things. I see a NYT or USA Today bestseller. I see more viral books. I see regular write ups on us and our authors. I see foreign rights deals. And I see me being there for all of it — but perhaps not all by myself. This article is reposted from The Guardian. Happy #NaNoWriMo! NaNoWriMo stands for National Novel Writing Month, and takes place every November. It’s for anyone thinking about writing a novel. To take part all you need to do is commit to writing 50,000 words of your novel in the 30 days of November. There’s a website where you set up a profile, with incentives in the form of badges, and a supportive social media community to cheer you on as you strive to meet your daily word targets. And some great novels have started as NaNoWriMo projects, Erin Morgenstern’s The Night Circus, and Rainbow Rowell’s Fangirl, to name but two. For the past two years I’ve taken part in NaNoWriMo, although I cannot claim to have ever “won”: that is, achieve the full 50,000 words. I think it’s great. If only for the fact that if you write every single day you’ll develop a positive habit and your writing will improve. I wish I’d known about it when I was writing my first book, because developing the habit of writing every day didn’t come easily. This is pretty much how every conversation went in the period between me having the idea for my book, Beetle Boy, and me actually sitting down to write it. I – like everybody else – have a truck-load of distractions that makes it impossible to find the time to write a book. Nevertheless, I had a burning desire to tell a story I had growing in my head, about a thoughtful boy called Darkus Cuttle and the staggering array of beetles we share the planet with. Maya Angelou once said: “There is no greater agony than bearing an untold story inside you.” And I came to know this to be true. The longer I didn’t write my book the more miserable and frustrated I became. I wrote Maya Angelou’s words on the inside of my notebook. I had to write my story, but when? I looked for the spare moments in the day in which I could write. I would get up, get myself, and my son, dressed, we’d wolf down breakfast, I’d rush him to school, then commute to work. I’d do my days work, dash back to the school, bring him home, make dinner, put him to bed, and right at the end of the day, once the house was quiet, I’d sit down and try to write. But I was knackered, my brain was fatigued and my body exhausted. All I really wanted was a large glass of red wine and to watch some crap tele. I rarely got down more than a sentence or two. Writing felt like the hardest thing in the world. Then it occurred to me; I was trying to write when I was tired. In fact “I’m tired” is the most common thing I say. I had never considered how sharp your mental faculties needed to be to write well. I decided that I would try and write at the beginning of the day, before my son woke up. So I set my alarm for five o’clock in the morning. At five, I’d get up, make a cup of tea and a hot water bottle, – it’s cold at that time of day – and sit down in front of my laptop, and, finally, I began to write my book. If you can write 1000 words a day, that’s 5000 words in a week. The average children’s book is 55,000 words long; that’s 11 weeks of writing. 2. Carve out a time and place for writing. You need to develop writing as a habit that fits into your daily routine. I wrote at 5am in a freezing lean-to conservatory, but it was my special time of the day where I did something truly for myself, and I loved it. This is not a hobby, or an indulgence, but a serious piece of work that you expect to be paid for one day. If you don’t treat your writing as work, then the people around you won’t take it seriously either. You need them to respect your writing time. The first draft is all about getting it written. The second draft is about getting it right. You must not look back. You must only progress forward. You are Orpheus in the underworld, and your novel Eurydice. If you look back you will never drag your novel out of hell and into the land of the living. Resist all urges to tinker, improve or amend your first draft. If you start meddling you will never get to the end. Remember, writing is a job, do it Monday to Friday. Give yourself weekends off. Weekends are for lie-ins, family and having fun. You brain will use the down time to process problems and brew-up ideas. If you can’t talk about what you are writing, or let anyone read it, then you eliminate doubt and insecurity from the process of writing. Other people’s reactions to your work can make you question everything, including why you’re doing it in the first place. Writing a book can be as intoxicating as having an affair, all day your head will be full of your story, the characters, things they say to one another, and if you keep it secret, you’ll be desperate to get to your keyboard, because secrets want to be shared. It may sound crazy but keeping it a secret creates momentum and helps keep you going through the tough times. It took me just over five months to write all the way to the end of my story. I had written 120,000 words of messy prose, but my story was out of my head and on the page. I felt elated. I had something to work with, to improve upon. I had written a book. That first book eventually became Beetle Boy, and was snapped up by Barry Cunningham, the man who believed in JK Rowling’s Harry Potter, and it will be published by Chicken House in March 2016. I still have to pinch myself when I think about it. The best advice I can give anyone wanting to write a book, is to write every day. With your first book, this is an act of blind faith. But I promise, if you write every day eventually you will have written a book. 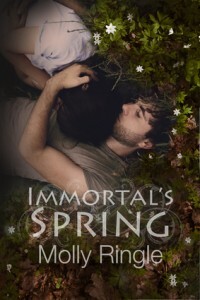 It is with great pleasure that I introduce Noah Milligan, the newest author in the Central Avenue Publishing cache of talented writers. Noah splits his time between words and numbers and is a longtime student of physics, prompting him to write his debut novel, An Elegant Theory, which was shortlisted for the 2015 Horatio Nelson Fiction Prize. His short fiction has appeared in numerous literary magazines, including MAKE, Storyscape Literary Journal, Empty Sink Publishing, and Santa Clara Review. He is a graduate of the MFA program at the University of Central Oklahoma, where he studied under Rilla Askew and Constance Squires. He lives in Edmond, OK, with his wife and two children. An Elegant Theory will be out in October 2016 and is an existential psychological thriller that explores how the construction of memory and consciousness can shape motive, guilt, and identity through the lens of a modern-day mad-scientist motif. Coulter Zahn is a promising PhD candidate at MIT, completing his dissertation on string theory, while his young wife is expecting their first child. Coulter’s already delicate mental state becomes irreparably fragmented, however, when his dissertation is strongly discouraged by his mentor, his estranged mother returns, and his wife informs him that she wants to leave him. His life and mental health unraveling, Coulter unwittingly commits a heinous crime, but before he can summon the courage to turn himself in, he catches a break in his research. Influenced by those surrounding him and his own untrustworthy psyche, Coulter must decide whether to face the consequences of his crime or finish his research, perhaps making the greatest contribution to science since Einstein’s theory of relativity. You can follow Noah on Twitter, Facebook or visit him at his website. His posts are insightful, interesting and follow a wide variety of topics. Welcome, Noah! Back at the start of the new year, I was approached by Laura Thomas to speak at her conference for young writers. 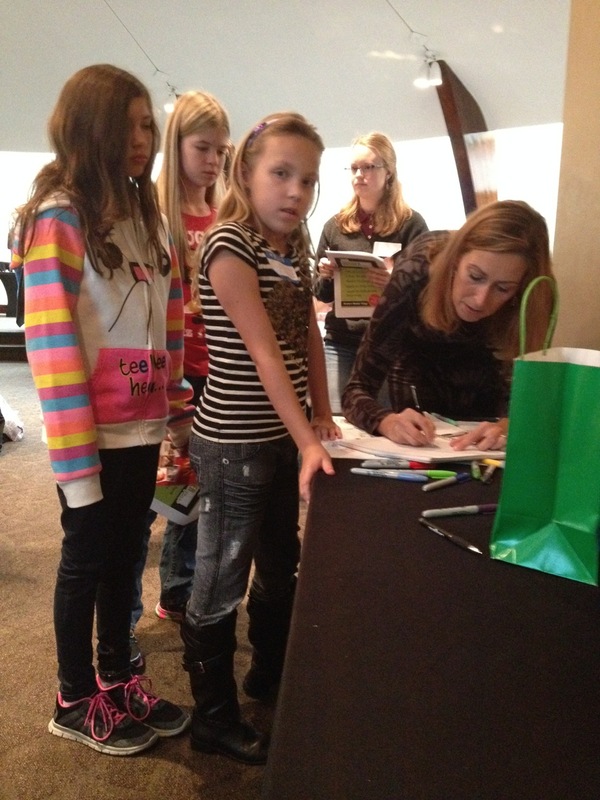 The conference was held on October 18 at a Vancouver hotel and there were about 60 young writers in attendance. I based my talk on Publishing Options for the New Writer on not speaking to kids, but to emerging authors. When I arrived, I saw that most of the attendees were 11-13 years old and my heart fell. I thought, “I am going to bore them to death!” So, I gathered my courage and walked to the front of the room. While things started off pretty normally, after about 7 minutes into my 45 minute time slot, there were so many questions and animated comments from the attendees that I realized I quickly wasn’t going to get through my prepared speech. Actually, their questions were so valid and on-point that it was like they knew what I was going to be talking about. I remain supremely impressed by these young people – their intellect, their desire for writing and their ambition. I am posting my talk here, mainly in the hopes that it may help other writers – young or old. And I can’t wait to see what kind of books these young people produce – I’m almost positive there will be a bestseller in their midst. And the highlight of the day: finishing my talk, going off to the side to answer a few questions, only to turn around to see 50 kids waiting for my autograph! I’m Michelle Halket, and I make books. I don’t write them, I take what others have written and I turn it into a book. About 6 years ago, I had a conversation with someone about how difficult it was for authors to get their work out into the world. And how that was such a shame that so much creative spirit never gets acknowledged. And so, I decided to start a website that would help authors get their work “published”. At the time, it was just going to be a simple website where people could publish their books, novellas, stories, poetry, etc. But as I researched the concept, I saw one very small, but very interesting trend – ebooks. So I decided I would take pretty much anything that someone wrote, pop a generic cover on it and make it into an ebook that people could buy from our website. At the time that we launched, we were called ireadiwrite – and nobody knew what ebooks were – they were this fringe thing that I had to explain every time I told someone what I did. It was brutal. I didn’t charge the authors anything, I would just take a portion of what they sold, much like with traditional publishing. But like music, the digital form took off and enabled me to surf that wave. And as we grew, I realized that I wanted to produce books that I liked, that I wanted to read, that I felt were good. So we evolved, and almost 4 years ago became Central Avenue Publishing. Today, we are a traditional press that is proud to house over 30 authors and have published over 100 titles. Most of our books are by American authors, but we do have six Canadian authors, one Australian, one South Africa and a photographer from Germany. We publish nearly every genre. My one rule for publishing something, (other than liking the book) is liking the author. A publisher and writer work closely together, even if we never meet in person, so it’s important to feel that I can work well with someone. Our books are reviewed or discussed on book review blogs on average twice per week and this doesn’t include reader social media sites like Goodreads or Shelfari. Many of our books have gone on to hit store bestseller lists, including Across The Hall, Amber Frost, Can You Hear Me Now? and our most popular book, I Wrote This For You is now stocked at all Barnes & Noble stores in the US. No matter what type of work you’ve written, or which publishing option you choose, you need to have the absolute best version of the work ready to go before you start on any path. This means it’s finished, been beta read, edited for structure, style and copy and finally proofread – a few times. I can’t tell you how many queries I see for books that haven’t even been written, or are written so badly and fraught with typos, that I can’t believe they own a word processor. So no matter what you do, please do all that is necessary to create the best work you can. My next question is the most important… Do you really want to be a published author? Because once it’s out there, especially in this digital age, there’s no way to unpublish it. Having others read your work can run the range of being most satisfying to being very stressful and upsetting. Most of the writers I know are introverts, meaning they get energized by being alone or just with a few close friends rather than being with a lot of people or having an audience. Once your book is published, you open yourself up to criticism, both constructive and destructive. Often times, there are just plain old mean reviews of your book, just because there are haters and the internet gives them a place to hang out anonymously and come up with funny ways of saying how bad something is. These are things you need to think about. As a published writer you need to have a thick skin, detach yourself from your work and learn from the inevitable criticism that will result. But for most writers, having their work read is the reason they write. So, if you’re up for the consequences and challenges of being published – then let’s learn a bit about that. Today, you have so many more options to get your work out into the world than authors ever had before. In traditional publishing, the author writes a query letter or a proposal, and submits it to a literary agent. Most publishers will not accept queries directly from authors, preferring to use agents as a middle person to help weed out the weaker proposals. If the agent accepts the authors, he or she will shop it around to the acquisitions editors at the various publishers. 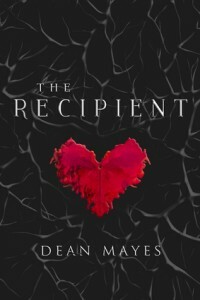 The editor reads it, considers whether it is right for the house, and decides either to reject it (leaving the agent free to offer it to another publisher) or to publish it. If the publishing house decides to publish the book, the house buys the rights from the writer and pays him or her an advance on future royalties. This advance represents what publisher thinks the book will sell and is paid up front to the author. Once the book starts selling, the advance is “earned out” and the author won’t be paid again until the book sells more than what the advance was. The house puts up the money to design and package the book, prints as many copies of the book as it thinks will sell, markets the book, and finally distributes the finished book to the public. This whole process takes about 18 months to 2 years. The major trade book publishing companies in the United States are often referred to as “the Big Five” (formerly “The Big Six,” until Random House and Penguin officially merged in June 2013). They are Hachette, HarperCollins, MacMillan Publishers, Simon and Schuster and Penguin Random House. Most authors would consider getting published by an imprint of one of these companies as the epitome of their writing careers. To many, it represents fame and fortune. But getting there is challenging. Selling yourself to an agent is difficult enough. There are thousands of agents – and getting them to notice you among the thousands of queries they get can be difficult – even when they are open for submissions, since many of them are only open for submissions at certain times. With the changes in reading and bookselling, big publishers are relying on big names to keep up sales, so unless you are a celebrity, you’re going to have a difficult time selling your book. It’s not impossible, but it is unlikely. Within the realm of traditional publishing, there are thousands of smaller presses who operate in a similar fashion to the larger publishers but have carved out a niche for themselves in a particular genre or regional focus. The nice thing about getting a small publisher is that you don’t always need an agent, so approaching them is a little easier. It is extremely difficult for the typical unknown author to get a publishing contract, and many ‘vanity publishers’ or subsidy publishers sprang up to give these authors an alternative. Essentially, these companies would publish any book in exchange for payment up front from the author. The term “vanity publishing” arose from the common perception that the authors who paid to have their book published were motivated by some overestimated sense of their own talent. The cost to have your book published by one of these companies is very high – the author chooses which publishing ‘package’ they want which can range from $1,000 to $10,000. There is no guarantee of sales, but the author does get a finished book in their hands. Have any of you heard of crowd funding, like with KickStarter or IndieGoGo? For those who haven’t, a crowd funding site is a way of raising funds for a project by appealing to a large group of people who can donate as much as they wish. It works for charitable causes, music, small businesses, and authors too. With the success of these crowd funding sites, we are starting to see some crowd funded publishing companies which combines a vanity publisher with a self publisher. Unbound and Inkshares are the two more popular ones but there are rumours that Amazon will be doing it too. Basically this means that authors sign up and appeal to people to fund their project by making donations. But instead of then having to go out and do everything themselves, the publishing company takes over and does it for you, once you’ve raised the $5,000 or so that they ask for. Self-publishing is the publication of any book by the author of the work, without the involvement of an established publisher. The author is responsible and in control of entire process including the design of the cover and interior, formats, editing, proofreading, price, distribution, marketing and public relations. Authors can either learn all the things they need to do themselves, or they can outsource all or part of the process to companies that offer these services. The problem with outsourcing is that authors need to have money to do it, and it can costs thousands to hire editors, proofreaders, cover designers, interior book designers and ebook coders. Many authors turn to crowdfunding websites like Kickstarter to get money, or fund the publishing process themselves. If an author elects to do it themselves, they can choose the format of the book they want to produce. Creating an ebook would mean distributing it to the five major ebookstores including Amazon, Apple, Barnes & Noble, Google and Kobo. Not all that long ago, you had to get your own ebook created and then find a company that would distribute it to these and the many other ebook stores that were around. Now, it’s terribly easy. For the most part, you can sign up, upload a word document and the bookstore’s online portal will convert your document to ebook formats for you. If you don’t want to deal with each store individually you can use a distributor like Bookbaby or Smashwords who will take your word document convert it and distribute it for you. If you want a print book, you can create accounts with either of CreateSpace (an Amazon company), IngramSpark or Lulu and upload a print ready pdf and cover design and using a technology called print on demand, they’ll print your book for you – either one or 1000, it’s up to you. With so many choices and with the changing trends in reading and publishing, how do you know which is right for you? There is a terrible misconception that getting your book published by a traditional publisher means fame and fortune and a road to a Man Booker or Nobel prize. This isn’t the case. Getting a book deal as an unknown author could very well mean a small advance and a print run of just a few thousand copies which then get returned to the printer. Traditional publishers want new authors with an established fan base/platform. The problem with traditional or legacy publishing is that print books and the old model of distributing them is languishing. Bricks and mortar bookstores are closing down and print books are expensive for publishers. So the prospect of hitting it big as a writer is about the same as winning the lottery. Does this mean that you give up on traditional publishing? No! Publishers have a great amount of experience and ability behind them and they can be your best collaborators and advocates for your book. But go into it knowing that becoming the next JK Rowling is not likely, that building your craft and your readers will come mostly from your own efforts – not from theirs. How you decide to put your creative work out is really based on two things: What kind of personality you have and the genre of your work. and you believe you have a superior piece of literature, then by all means, go for it! I’m a publisher and I am blessed to work with many talented authors. I don’t mind doing the work for them and letting them just do the writing. But marketing is a joint venture and they put in as much work on marketing themselves and their books as I do. I mention the last point about marketable genres because I think that it’s important to realize that publishers are business people – they want books that sell. So if you write in a genre that has a timely subject matter, or is currently popular like dystopia or YA paranormal, you may have more likely chance of getting it accepted. You want all the royalties! In fact, self published authors and their books are forging the path of publishing into places never seen. In fact, according to a report released earlier this year, self published authors account for 55% of all dollar revenue from ebooks on Amazon. 38% comes from Big Five published authors. Whether you choose to self publish or follow a more traditional path, I strongly recommend reading and researching both paths. I personally follow Hugh Howey, Joe Konrath and Nathan Bransford who all have excellent insight into publishing trends. Cookbooks: As a person who cooks a lot – I regularly turn to the internet and blogs for recipe ideas. So, anyone who enjoys cooking and who likes to tweak recipes should first start by starting up a cooking blog. Couple your recipes with great photography and it’s a great way to build up a fanbase. The best and most successful blogs often get book deals out of it. 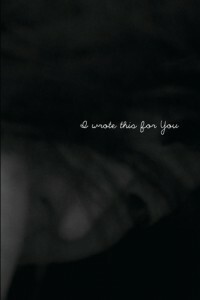 Poetry: Our bestselling book is I Wrote This For You, a book of poetry and photography. But as a genre, poetry is a not generally a fast seller. But the success of this project is based on its success as a blog where it garnered thousands of followers. Now as a book, it’s sold tens of thousands of copies and is being translated and licensed by overseas publishers. For other poets, I strongly suggest getting involved in the local poetry scene. A variety of restaurants and cafes hold poetry slam nights with an open mic. Check them out and get some valuable feedback on your work. Regional Interest/Charitable: For exposure, I suggest checking out crowdfunding sites like KickStarter to help you get a fanbase and fund any self publishing or creative work you do. Self-Help/Advice/Memoirs: Social media has opened up so many avenues for creative people. A few years ago, there was this Twitter account called Sh*t My Dad Says. And it was this one young man who just simply quoted the words his father said to him. It got so popular, his followers grew by the thousands every few hours and he ended up with a #1 New York Times Bestseller. Kids Books: While digital books are growing, kids books don’t seem to do as well in digital as they do in print. If you’ve written a book aimed at kids 12 and under, I would make sure you have a print version. But if you or your friends have some app-building abilities, then go for it – books as apps are on the rise and create a whole new experience for young readers. In conclusion, there are so many ways to get the fruit of your creative labours out there. From traditional to self publishing, to using the internet in its myriad ways. Pay attention to the trends out there – reading is going digital and getting shorter. Read about what is happening with other authors and their experiences. Listen more than you talk. The way you publish will depend really on your personality, so pay attention to what kind of person you are and decide what is most intriguing for you. Find unique ways of sourcing out what you need. Ask an artistic friend to design a cool cover for you and share the royalties. Work with a detail oriented family member to read and edit your book for you. Pair up with a mentor who can teach you more about their writing experiences. Start a blog and post your poetry. Open up your twitter account and listen in on some chats about self publishing and ebook coding. Connect online with other like minded authors who are doing what you’re interested in. Listen more than you talk. And stay away from negative places, either bitter authors ranting about the injustices of the publishing world or the hating readers who love to leave bad reviews. If you might indulge me for a moment, as artists who create, I ask you: Pay for art. Support those around you who create, so that you help create a culture that values art enough to support those who make it. I’m not asking you to buy a thousand dollar painting. But if you’re given the opportunity to pirate a song or a book, think twice, and reconsider. Sure, the record label makes money, and so does the publisher. But so does the artist. You are the artists who will create a world for yourselves, so refuse to create one that attaches no value to your work. We don’t want you to stop writing so you can do other things just to make money. Because then we’ll all lose. And finally, if you have a finished piece of work, and you want to share it – please do. You make the world a better place by sharing your creative spirit. Reading fiction is my escape. My stolen moments where I escape into the mind of people I would never normally have the chance to meet, to find myself situations both real and fantastic, to experience profound emotions that rarely present themselves in regular everyday life. I often find it difficult to put a book down and turn out the light. I just want to keep reading. Before my days as a publisher, I never put much thought into how those stories came about, the process, the pain, the joy, the pride and the self-loathing that goes into writing. After having worked with dozens of writers, I now have a small glimpse into what it takes to create those places, people and events that take the rest of us away to places uncharted. So, let me first speak for all readers and say to all writers out there: Thank you. Thank you for creating what we cannot, for following your dreams and your heart on the road that you must take to write. If an author is one of the lucky ones that makes enough to support themselves on their writing, that is indeed a wonderful thing. But if you are like the vast majority of writers, you are working one or more jobs in addition to your writing, much akin to supporting an addictive habit. Regardless of what one is paid, there is an inherent true value in writing. I am a huge fan of Steven Pressfield and his book, The War of Art. I often quote and credit him for his advice – which is that a writer does the world a disservice if they do not write. If they ignore the muse and push that urge aside – we all lose that creative energy. So please – keep writing. While storytelling is as old as humankind, there has been a shift in the world of reading. While we still read novels, we are reading more and more in short spurts – getting our fix in non-traditional forms; stories on blogs, micro-poetry, twitter haiku. Even novels are sporting shorter chapters, making it easier for us to read and follow stories in shorter increments. In an age where we read in smaller segments, I believe the value of the short story is more pronounced. The changes in the publishing industry and the reading universe mean that there is a shift in power to the author and to smaller publishers. The beauty of these changes in reading and publishing means there are more venues for the short story – and for the author. The opportunities for shorter pieces are increased yet again with the advent in subscription based reading services. With these, the cost for a month’s worth of reading is the same – whether it be in the form of longer or shorter works. Since we are craving a shorter period to gratification – the short story is a perfect fit. It is a great thing to read an anthology such as this. It fosters the art of the short story and encourages the power of young writers in an ancient industry that is being forced to renew itself. Young writers creating relevant works in a new old world: now that’s a story that I can’t wait to keep reading.